Home visitation has been the core work of the St Vincent de Paul Society since our 20 year old founder Frederic Ozanam and his university friends visited people experiencing disadvantage in the poor areas of 1830s Paris. Since then the work of Frederic Ozanam has spread around the globe. St Vincent de Paul Society members today take the lessons taught by Frederic to understand the underlying causes and circumstances that can cause social divide and lead to people experiencing disadvantage. 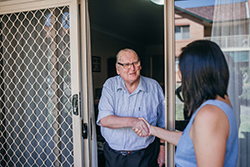 Each day across Australia more than 20,000 Society members continue to visit people in their homes so that the Society can provide the best possible assistance. Members assist people in a number of ways including providing people with referral information, advocacy, food or food vouchers, clothing, furniture, budget support, assistance with utility bills or back to school costs. When Joan and William first migrated from England to the warm NSW coastal region of Lismore they embraced their new life with gusto. Everything was going from strength to strength until William was sadly diagnosed with cancer and was no longer able to work. Joan was facing health problems of her own battling serious osteoporosis which needed pain management medication. The couple had lived in Australia for nine years but weren’t yet Australian citizens so were unable to receive government support or health benefits to assist with their high medical costs. With no income and the bills mounting, the couple were struggling to keep up with their rent and food costs. That’s when they turned to the St Vincent de Paul Society. The Society stepped in and provided urgent financial assistance for Joan’s pain medication and the couple’s rent. Staff also assisted them in their citizenship process meaning they were able to eventually get subsidised medications and a health care card. Joan said that the financial and emotional support that the Society provided to them was a lifesaver. “Without Vinnies I do not know where we would be. We are eternally grateful for what they have done for us and without their help we would not have survived,” said Joan. If you’re interested in becoming a member of the St Vincent de Paul Society Conference near you, please click on this link for member information and you will be taken to a list of contacts in your state or territory. 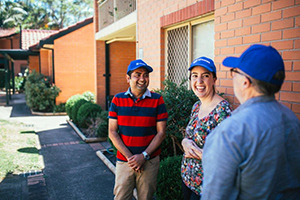 Nationally, the St Vincent de Paul Society offers in excess of two hundred programs and services designed to help those who are socially excluded and marginalised. We do this by respecting people's dignity, sharing our hope, and encouraging them to take control of their own destiny. To see a full list of services provided by the Society in your state or territory visit the Find Help section on this website or click on the links below.